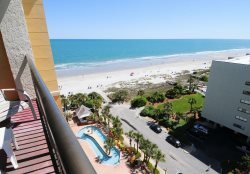 This unit is located on the eleventh floor and is oceanfront with miles of shoreline to view. It has been newly remodeled with tile floors, new beds, mattresses, pillows and other upgrades. The unit sleeps up to six and is a one bedroom with two double beds and a pullout sleeper sofa. The accommodations are cozy and efficient. When you first walk into this gorgeous condo you will see the two full beds with a flat screen TV for your enjoyment. As you walk through the bedroom area you will head into the galley style kitchen which includes a full sized refrigerator, coffee pot, standard stove, dishwasher, toaster, microwave, sink, and all the dishware and silverware you could need, also hair dryer for your convenience. The Sand Dunes Resort is an oceanfront facility with a lot more to offer than just the beach. Within the facility you have use of the Indoor/Outdoor pools, whirlpools, and an outdoor lazy river. The resort also has Mango's Lounge, the River City Cafe and a California Pizza restaurant.